If you’re like most people, the reason you’re looking at OpenStack for a private cloud is because your developers fell in love with public cloud, and you want to give them the same experience, but with better economics, control, and performance of a private cloud. The reality is that instead of looking to replicate the public cloud experience, privately, we often run in to people that want to fiddle with every aspect of the infrastructure and OpenStack® itself. how your apps will run, and how your private cloud will integrate with your existing systems and apps. companies that need to go that route is very small. After talking to thousands of people about their private cloud journey, we’ve created a simple checklist on the next page to help you determine if you’re ready for an OpenStack® private cloud. Check the boxes that apply to you, and add up your score! 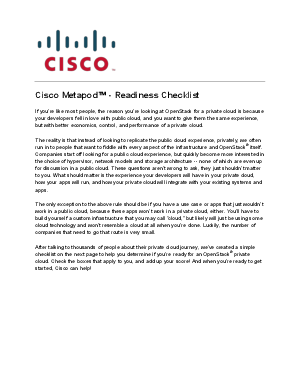 And when you’re ready to get started, Cisco can help!